The BlackPearl Friesian Dance Troupe will perform daily at the Northwest Horse Fair 2019, as their fancy dancing horses provide high stepping action to music. Photo Credit: Alise Lamoreaux. Experienced trainers have just 3 days to gentle, saddle, and ride young unbroken horses in the Colt Starting Challenge USA, at the Northwest Horse Fair 2019. Photo credit: Andra Kaus. BreyerWest®, returns for the fourth year, to the Northwest Horse Fair 2019! BreyerWest features open and youth model horse shows, plus workshops and activities for model horse hobbyists and enthusiasts. Photo Credit: Alise Lamoreaux. 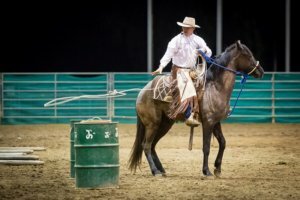 The equine entertainment at the Northwest Horse Fair is filled with variety, that’s second to none! The BlackPearl Friesian Dance Troupe will perform daily, as their fancy dancing horses provide high stepping action to music. Endo the Blind horse will demonstrate remarkable training and connection with his owner/rider and trainer, in an amazing performance! And Marcia Moore-Harrison will perform a special Cowboy Dressage performance to music, daily before her clinics. Ramping up the action the Rhinestone Cowgirls Precision Drill Team will perform fast-paced precision formations set to music. Sending the action to a flat out gallop, the Oregon Mounted Shooting Association will present Cowboy Mounted Shooting, on the run! The Breed Showcase and Stallion Reviews will represent breeds from all over the world, and provide educational demos and performances featuring the strengths of each breed. The Rhinestone Cowgirls Precision Drill Team will perform fast-paced precision formations set to music, at the Northwest Horse Fair 2019! Seven-time U.S. National Championship Dressage competitor and a international Grand Prix rider and trainer, Mette Rosencrantz will give Dressage clinics daily at the 20th Anniversary celebration of the Northwest Horse Fair 2019! The Northwest Horse Fair 2019 will feature a Breed Showcase and Stallion Reviews representing breeds from all over the world! Photo Credit: Alise Lamoreaux. Randal Walker is a third generation rancher, who uses his Satus Stockdogs on his ranch located in the Satus just outside Toppenish, WA. After years of working with, and training stock dogs, Randal has the ability to recognize, breed and train top quality stock dogs. These highly trained dogs are used as an everyday asset to a large cow/calf operation. Every dog has a job to do and must do it well. On Saturday at the Northwest Horse Fair, Randal will present a “Ranch Dog Demonstration”. Additional educational workshops, demos and lectures will be offered throughout the three days of the expo. And radio and on-line TV host of Speaking of Horses, Wayne Williams, will be on hand. Sponsors for the Northwest Horse Fair and Expo 2019 include: Akins Trailer Sales, the presenting sponsor; Beelart Embroidery, the official event embroiderer; Fitzgerald Corrals; KMTR-TV, the Youth Day sponsor; KRKT; Logan Coach Trailers; The Northwest Horse Source, the official publication of the Northwest Horse Fair and Expo; Phoenix Inn & Suites, the hosting hotel for the Northwest Horse Fair and Expo; and Wilco.